This book is catalogued in the ‘LIBRARY OF CONGRESS’- Washington DC, ‘AMES LIBRARY’- University of Minnesota, Library of ‘UNIVERSITY OF CHICAGO, ‘LIBRARIES AND ARCHIVES’ of Canada, and LIBRARY of CANCER AID AND RESEARCH FOUNDATION, Mumbai. 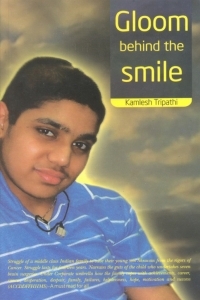 GLOOM BEHIND THE SMILE a real life story of a young child cancer patient who battled Cancer for 14 years. He was diagnosed of brain cancer when he was around 2 years and he expired when he was sweet sixteen. Long … long battle. Written in a positive tone. ‘Kamlesh Tripathi and his family have gone through a great tragedy. It is a tribute to their resilience of spirit that they have succeeded in extracting a positive outcome even from the grimmest of circumstances by penning this book. By sharing the story of his son’s battle with cancer and how the family coped with it, Kamlesh has sent out a beacon of hope that will guide and sustain those in similar circumstances. It is an inspirational account of the power of the human spirit to endure and triumph over adversity. There can be no better memorial to young Shravan than this book and the impact it will have on the lives of others. … Mr. Anand Mahindra, Vice Chairman & Managing Director, Mahindra & Mahindra Ltd.
‘This book tells the story of a family journey no-one hopes to experience. … HE Mr. Rupert Holborow, High Commissioner, New Zealand High Commission, New Delhi. … Mr Rajan Nanda, Chairman and Managing Director, Escorts Group. E-book is available in http://www.antrik.com for Rs 150 or equivalent. In case you require a print copy kindly contact flipkart , Crossword or any online book store or send us a message and we will organise it for you. The price would be Rs 150 + 30 courier charges. Shravan Charity Mission is a NGO that works for poor children suffering from Cancer. The proceeds of this book too would be spent on such unfortunate children.